Please refrain from posting messages to sell, purchase, or offer to sell any product or service. All submissions are reviewed by the site maintainer before being approved, and may be edited for content. If you are a visitor, or have yet to register with our site, please leave a message in the guestbook. Flights are around $700. I am very interested in going. Should know by next month if it is going to work out. I am thinking of going to the dedication also. Anyone been back recently? Wondering what airfare and hotel prices are like. I would like to go to the temple dedication. Has anyone been back as to visit. I'm wondering about car rentals, safety, etc. 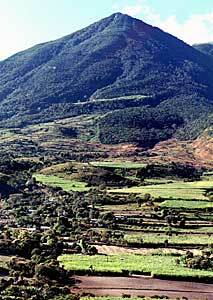 I served in Moncagua zona San Miguel in 1998. Would love to hear from anybody that served there after me to know how the members are doing. I was wondering if anyone was planning on going to the Temple Dedication when it is dedicated? Espero que todos esten bien, he tratado de comunicarme con algunos de los conocí por allá de Nov de 1995 a Mayo de 1997. Alguien sabe algo de Jendalyn Mabey? por favor díganle que necesito que me escriba, ella fue mi compa en Soyapango. Les amo mucho ya han pasado 10 años y todavía les llevo en mi corazón. I was living in Guatemala and met a returned missionary who served in the San Salvador East Mission when President Nelson was serving. His name is Luis Antonio Marroquin Arias. We started dating while I was down there are we are now engaged to be married. He will be coming to the United States in a few months and we will be getting married in the Salt Lake area. I know that he would be over-joyed and thrilled to have some of his mission companions and friends attend. He speaks very highly of all of you. I know that his mission is one of the things that changed his life. If you were his companions or a friend who would be interested in attending the reception and/or sealing, please contact me. I am especially looking for the contact information for an Elder Nathan Bird and an Elder Gregory Ernfield since those are two names that I remember him mentioning. If anyone has information for contacting either one of them, please let me know. I would appreciate it and I know that he would be grateful as well. Does anyone know how to get in contact with good ol' Emfield (Greg from Idaho)? Hi, I am the sister of Elder Derrick Grayson who was recently killed in a car accident. I would like to have people e-mail me their feelings about Elder Grayson or any crazy experiences they have had with him. He truly loved being a missionary, and he loved serving in El Salvador. I know that he was grateful for all of you who were so loyal to him. Thankyou for your faithful service to the Lord. Hola; Es una gran oportunidad saber que cada uno de uds. estan bien y que siempre se esfuerzan por aplicar lo que enseñaron el la mision, estoy 100% seguro que fue uno de los mejores momentos y expriencias que tuvimos. Me gustaria saber de cada uno de ustedes, asi como los misioneros que compartimos grandes logros en el tiempo misional, y asi mismo a las hermas que estuvieron en mi sistrito y en la zona, en la cual estuve al pendiente, por el amor que desarrolle por uds. This is a friendly reminder of our fantastic mission reunion that we will be having this coming friday (09/30/05) at 6:00 PM at the Cardon's Residency. 4: Turn LEFT onto N 1300 W.
5: Turn RIGHT onto W 1800 N / W 1300 N.
6: Turn LEFT onto N 900 W.
7: Turn LEFT onto W 2200 N.
Has anybody served in Zona Ilopango, Las Canas? I have lost contact with a couple friends there and would love to know how they are doing. Does anybody know how Moroni, Alvaro, Karla, Evelynn are doing. Any information would be great. Thanks. Has anybody served in Moncagua? Is there a Chapel there yet or are they still meeting in a house? Would like to know about a couple families. I served there in 1998. Hi everyone! I'm going to the Guatemala City's MTC on 7th July, and then I'll go to the El Salvador San Salvador East Mission, so soon I'll be joining you all, just search for an Elder Alvarado, and you'll get me.. See you then.